I set a new freezer cooking record last week. I made 30 meals in 3 hours! I bought all of the ingredients from Costco for only $279 (and that included all organic meat and organic canned tomatoes). Here’s what I made, including my recipes and grocery list so you can do the same. 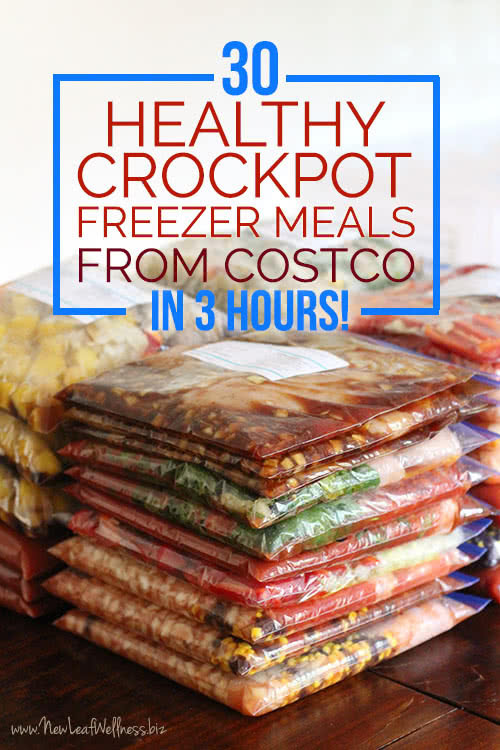 What’s so great about these crockpot freezer meals? I picked recipes with my favorite organic ingredients from Costco so we could save money and eat healthy at the same time. Woot! 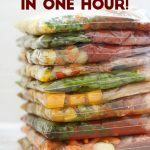 I made three freezer bags of each recipe for a total of 30 meals. That helped me save a lot of time and money. 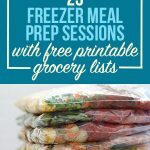 CLICK HERE TO SEE ALL OF THE FREE PRINTABLE RECIPES, GROCERY LIST, AND FREEZER BAG LABELS. 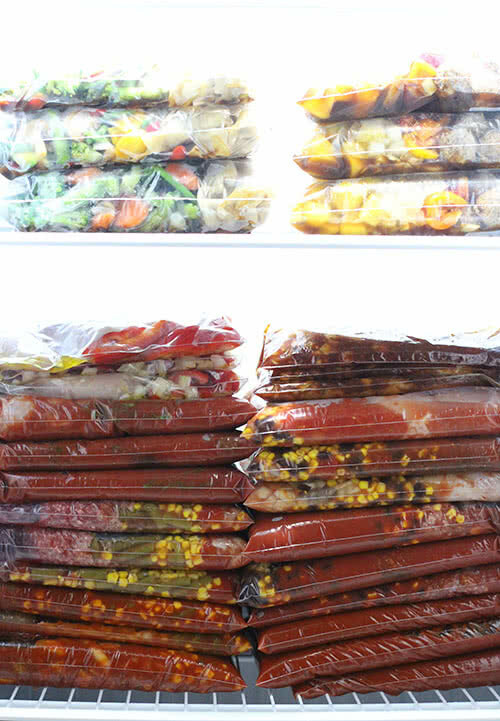 12:19-12:25 Stick freezer labels on all 30 bags. 12:41-1:09 Make first 3 recipes in an assembly line for a total of 9 meals. 1:31-1:39 Break to nurse my 5-month-old baby. 2:34-2:59 Take tons of photos for this blog post and stack my meals in my basement chest freezer. 3:00 Collapse on the couch with my baby and ask my husband if he’ll make one of the bags of Korean Potstickers Stir Fry for dinner. 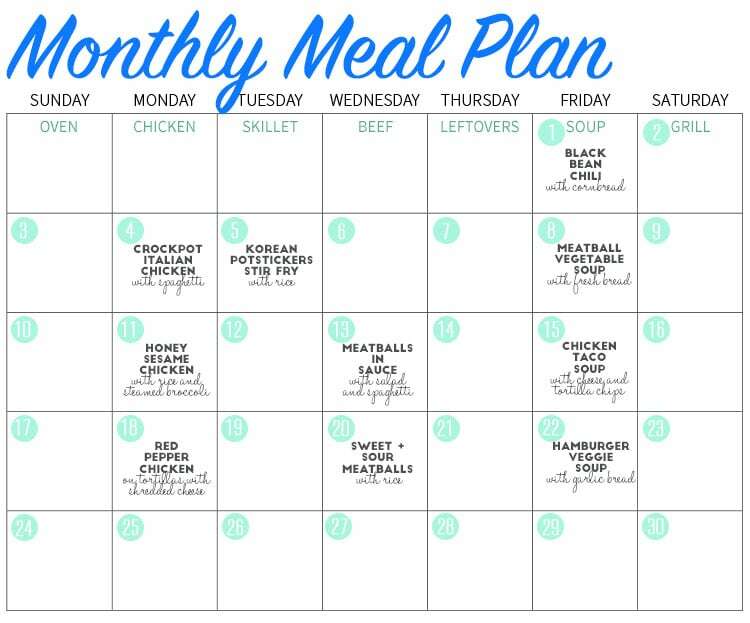 My friend Kristin from Live Simply taught me about picking a “theme” for each day of the week and it makes meal planning so easy. All you need to do is add in your favorite oven, skillet, and grill recipes or take those nights off from cooking. The great thing about freezing three bags of each recipe is that you can reuse the calendar again and again too. Yay! I buy frozen chopped onions instead of chopping them. It really really really is worth the tiny bit of added expense. 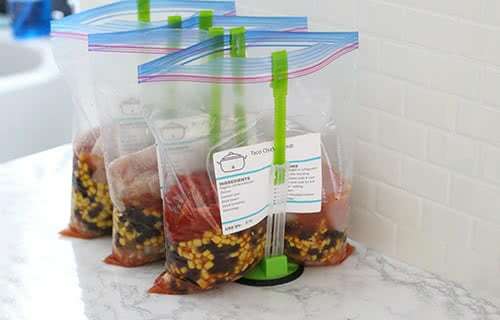 Just a tip from a fellow freezer meal mama! Where do you find the frozen chopped onions? In the freezer section of the grocery store by the frozen vegetables. They don’t sell them at our Costco so I buy them at another local grocery store chain. I was thinking the same thing but the ones I have found it doesn’t say yellow onions, just onions so wasn’t sure if they were white onions instead of yellow or if it really mattered. Any thought’s? Love the recipes, I cooked my first one tonight. I had a problem with The Korean potstickers though. They came out in one sticky mass of dough instead of individual potstickers. What did I do wrong? I think they might have been cooked too long. They will definitely be more soft than crispy, but they shouldn’t be stuck together. Another option is to try to break them apart when you add the meal to the crockpot. I had this problem too. Did you do them in the skillet? The bag of potstickers says to not move them when cooking them and to cook them frozen so I’m wondering if that’s the issue. Mine stuck together because they were thawed and the dough was sticky. I bet doing them in the crockpot will work better. Is it ok to leave these recipes on low all day while at work? It would be 10+ hours! Christine, keeping them on low all day may dry them out. Do you have a “keep warm” function? If so, use that. If not, you could use a house timer to set your crockpot and then go off after cooking. You may just need to quickly heat up your food before eating. I followed your plan for my single parent son as a Christmas gift. i included his three children (ages 9, 11, and 14) in the assembly phase. They were excited and very helpful; we were finished in three hours! Your plan is well presented and “doable”. 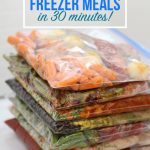 Our biggest challenge was freezer space! I gave my son a three ring binder with the recipes and photos of the kids in the kitchen wearing their Christmas aprons and hats! This was a huge success!! Thank you, thank you, for your ideas and your excellent presentation!! Where can I get the recipe, grocery list? Hi there, so if I wanted to do just each recipe one time, I could divide the ingredients on the shopping list by 3 right?? Yes, but that would be hard to do since they are bought in bulk packages from Costco. I cannot download the grocery list and recipes! Have tried and tried! Would love to try this out!! HI I’m trying to download the recipes and I am unable to do so. Maholo. Did you try a different web browser, like Google Chrome or Safari? I have that issue with tomatoes. When recipes call for that I make this recipe using beets and carrots. Gives the same tomato flavor but won’t make me sick. http://allrecipes.com/recipe/201097/no-tomato-pasta-sauce/ I leave “chunkier” when it calls for diced. But kids may not like knowing what is in there, so you may need to blend better. There is another one using pumpkin that is just as good!! Good luck. This recipe has made my life so much easier. Hi! How many servings are in each bag? 4-6. It’s broken down by recipe in the printable pdf. 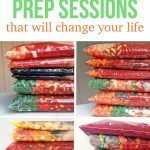 I found your blog via The Humbled Homemaker and really like your focus on healthy crock pot meals, especially that you package everything upfront! My crock pot has been waiting patiently to be taken out of the pantry and out to good use. Now it gets to come out and makes your wonderful recipes! I am planning to make these meals for my sister that has recently fallen victim to the rising Texas rivers. I’ve done all the shopping – which you made so easy – and I am now prepping my bags. It seems that the freezer label for the Taco Chicken Soup is not in the PDF. Did I overlook it? Whoops! I forgot to add it to the pdf. Will do so ASAP.